What was the hottest item at D23 Expo? It had to be the Snow White and Evil Queen dolls featured at the Disney Store pavilion. At $129.95 each, you’d think they would sit there on the shelf. I mean, who would pay that much for essentially a fancy Barbie doll? Me. And apparently thousands of other crazy Once Upon A Time fans. A very limited amount were sold to Sorcerer’s Package members on pre-sale Thursday where they were able to shop exclusively. The rest sold out very quickly. Not only were these dolls highly collectible at a limited edition amount of 300, but you were able to meet the actors Lana Parilla and Ginnifer Goodwin and get their autographs! I know I would have held on to mine. Or would I? On eBay, those dolls are going for over 10 times the retail price. After that, the “Red Slave Jasmine” doll was the next hottest item, also from the Disney Store. Only 500 of these were made and were retailing at about the same price. These too are currently going for over $1000 each. And you don’t get a cool autograph with those. After that, probably the number three item was the Elsa and Hans Collector Series dolls limited to 1023 that are going for nearly $1000. Now to be sure, already prices on these hot items have dropped dramatically and you can find an Elsa and Hans for about $400, but that’s still a huge mark-up from what you could get them for if you were able to get your hands on them. There were so few of these items and so many people that few outside of the Sorcerer’s Package people got them. But hey, more power to the Sorcerer’s people. If I spent that kind of money on a ticket, I’d certainly hope for priority access. And I’m glad so many people stood in line for upwards of 5-7 HOURS even though there was no hope of getting one of these high ticket items. It meant that other lines were not as long. But don’t get me wrong. Everything else that was a highly collectible item sold out, too. They may not have had the high eBay sales of these Disney Store exclusives, but they were hunted down nonetheless. The LEGO Wall-E exclusive comes to mind. I have no idea how much it cost or how people got one because by the time I realized they were even out there, none were to be found. This year, the Disney Dream Store was exactly that. A dream. It flowed so smoothly and operated so efficiently I was in and out of there in no time. The limited edition pins I wanted were available when I got there, and I waited less than 5 minutes to check out. I’m sure that wasn’t the case for everyone, and they were certainly well-prepared. Lots of cast members waiting to help out and to top it off since I’m a premium annual passholder, I got 20% off! 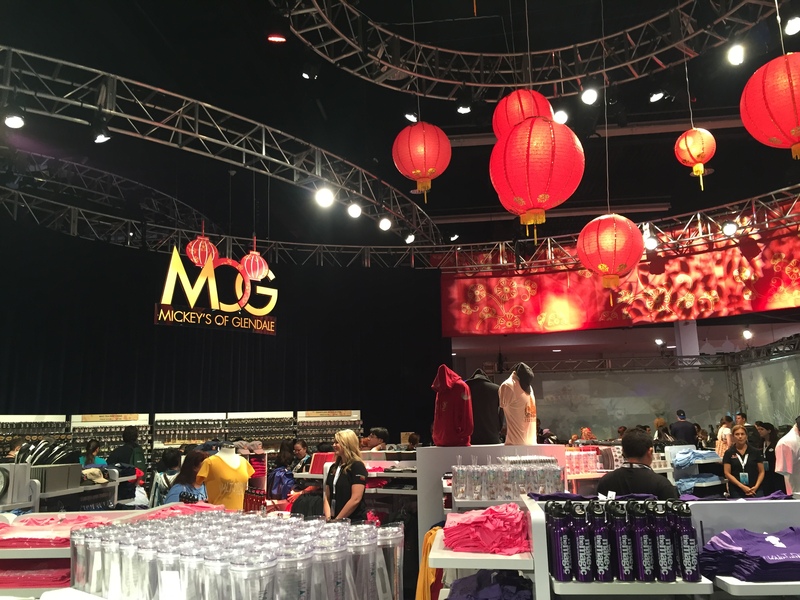 MOG, Mickey’s of Glendale – the Imagineering exclusive store – was slammed. Mostly because of pin collectors. Once we got done waiting the 45 minutes to get in (and we had it easy! Later, the line was about 3 times as long), there was ANOTHER 45 minute line to get the pins. Check out though was a breeze. Still, the opportunity to shop in MOG is always a treat, and for a pin collector a true paradise. 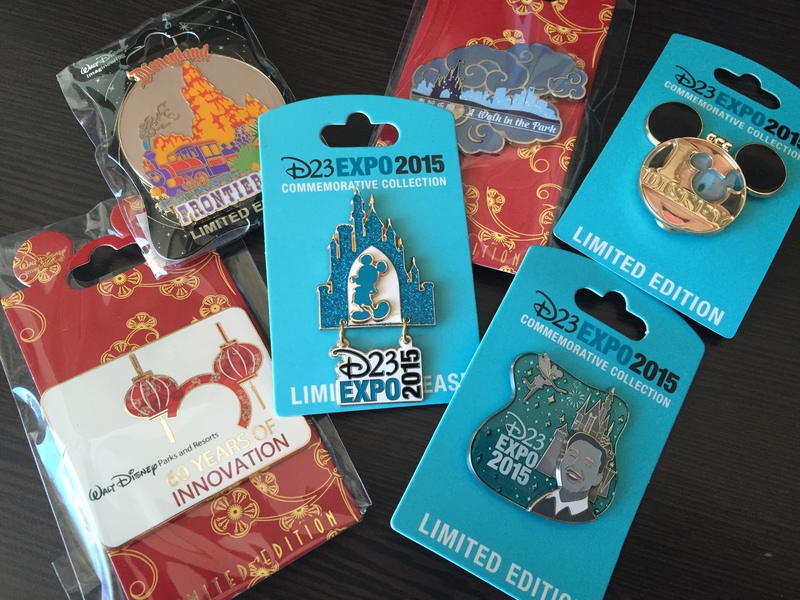 Most pins are LE 300 or less and they had exclusive pins for the Expo celebrating the opening of Shanghai Disneyland. Love the New Balance runDisney shoes! Besides the big 3 collectible opportunities, there were a number of pavilions selling Disney authorized products such as American Tourister with their special Disney / Star Wars related suitcases and Hallmark had some itty bitty’s exclusive to D23 (Cinderella and Prince Charming). 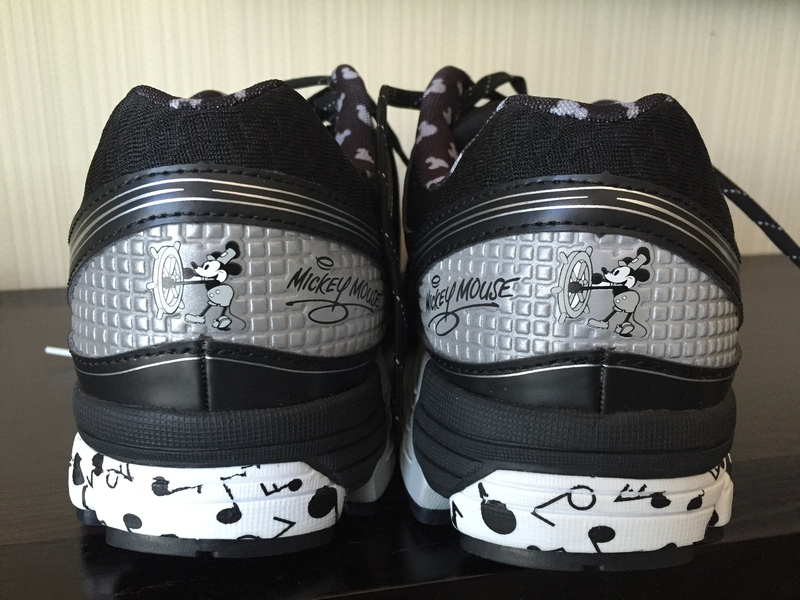 I got some exclusive runDisney Mickey Mouse 2015 New Balance shoes from the New Balance pop-up shop which are so hard to get as they generally only sell them at the runDisney expo events. But the best value for your money were the FREE Infinity 3.0 figurines they offered at the Disney Interactive pavilion and the EXCLUSIVE power up disc for Mickey they gave away at the Disney Interactive presentation on Sunday. Best presentation of the Expo. Probably the wildest collectible and unexpected surprise hit was the Disney VISA Trading Card Quest. 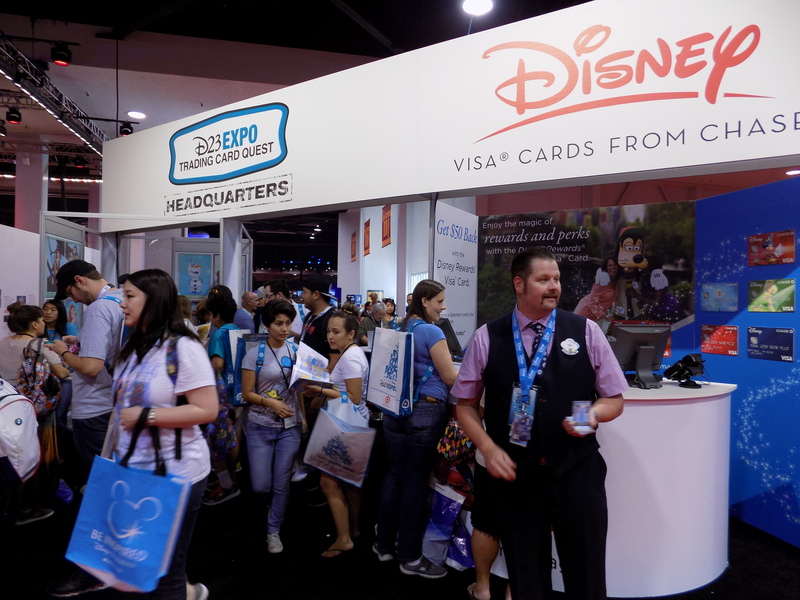 Every person who received a souvenir book had a starter pack of cards inside and at the Disney VISA booth they also gave away additional cards. Different people on the floor gave cards, too and it was insanely successful. When they announced a special card being given away, huge flocks flooded the floor. You’d think they announced another Red Jasmine was found. It was the first time I’d seen the Expo run out of souvenir booklets since people kept going back for mre. There were LOTS more collectible opportunities. I didn’t even cover all the vendors in the Emporium section of the Expo floor that had some pretty amazing things. To be sure, if you were willing to wait for it or spend the money to get it first, there were some incredibly rare and collectible items for the Disney fan available nowhere else. But even for those less intense, there were some great things to be had. If you have a love of Disney memorabilia, there really is no better place to be than the D23 Expo. Next Next post: D23 Expo 2015 – Everything is Coming Up Star Wars!